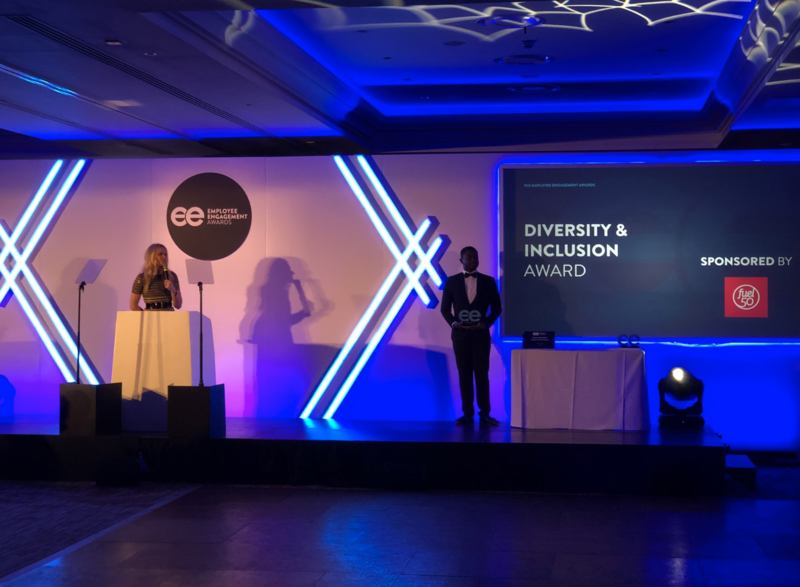 We are delighted to have been recognised at the 2018 UK & European Employee Engagement Awards for our commitment to Diversity & Inclusion. The Employee Engagement Awards celebrate companies who embrace diverse thinking and put employee engagement at the heart of their business strategy. Diversity and inclusion has always been at the forefront of Beyond’s core values. We’re committed to the important conversations and growth that occur as part of learning about our conscious and unconscious biases. Our aim is to remove exclusivity and barriers, and encourage new thinking and perceptions. It is about people. And without our people being their most creative and innovative selves, we are nothing. In our mission to become an inclusive workplace with equal opportunities for all, we’ve partnered with General Assembly to address the gender imbalance within our tech department, and together we built a talent pipeline that allowed for a 16% increase in female engineer representation. We’ve also partnered with 5 other international agencies to deliver a programme to elevate those from lower socio-economic backgrounds within creative agencies. Watch our video. Additionally, we internally promoted a female CTO, recruited a female CCO, have 40% female representation at the senior level in our London studio, and 50% of our global C-suite team is female. Aside from the demographics, we’ve also implemented initiatives like #IamRemarkable, a Google program that empowers women and underrepresented groups to celebrate their achievements in and out of the workplace. In our next phase, we are looking to create a sense of belonging for our teams. We recognise that no two people are the same, and that treating everybody the same will only result in fairness — it will not help those around us play to their strengths, or create a welcoming, supportive environment for all. Belonging sums up the feeling we want our team members to have. We want them to feel supported to do their best work. We want all to trust that our frameworks and structure are designed to elevate all of our people, and to create safe spaces for challenge and disruption without detriment to others. We want our processes to remove bias, and to give bespoke support to those who need it, when they need it.